Korean skincare is all about layering with a personalized regimen suited to tackle your unique skin issues – and the 7-step Korean skincare routine is no different. While a 3-step or 5-step covers the fundamentals such as cleansing, toning and moisturizing, a 7-step Korean skincare routine takes it to the next level. In 7 steps, you’ll address not only flakey skin by exfoliating, but also those pesky dark circles and wrinkles with anti aging serums and much more! And when/if you’re ready, your routine can turn into 10-steps with the addition of sheet masks and ampoules, therefore, taking your skin nourishing game up a notch! Before we unfold our 7-step Korean skincare routine, let’s take a closer look at how it stands out from the rest. Why a 7-Step Korean Skincare Routine? 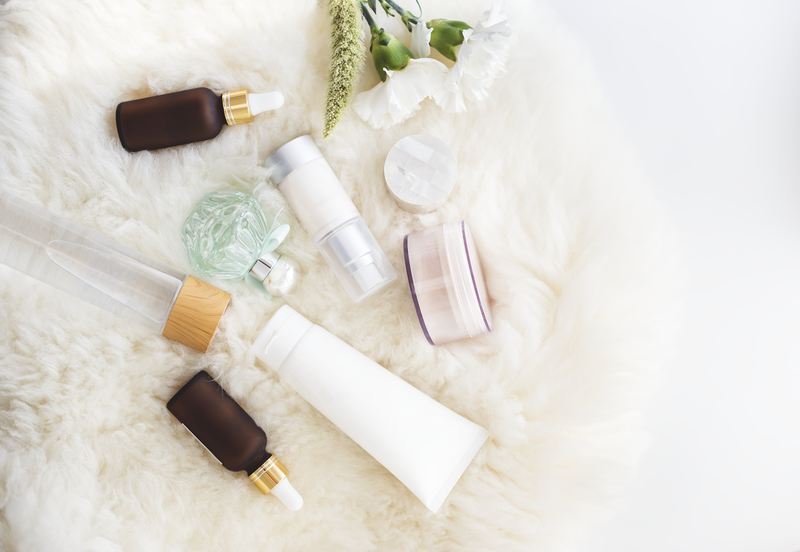 Korean skin care, or skin care in general, is nothing without the most critical products – an oil and water based cleanser, a toner, a moisturizer and an SPF sunscreen. The 7 steps includes these 5 with additional solutions to target your most stubborn skin issues. With 7-steps we believe that you’re going to be even better results if you include the exfoliator, an essence, and apply a moisturizer with SPF, rather than a more minimal routine where you just cleanse, tone and moisturize (although that’s better than just wiping off your makeup each day!). The exfoliator is going to make your skin incredibly soft and radiant as you’re removing dead skin calls and promoting cell turnover, and the essence adds so much hydration that your skin is hungry for. A moisturizer locks in all the layers, and sunscreen is anti-aging and protects your precious skin. Hydration is the key to Korean skin care, and the more hydrating layers you put on, the better. The only thing better than a 7 step routine is a 10 step – here’s why. 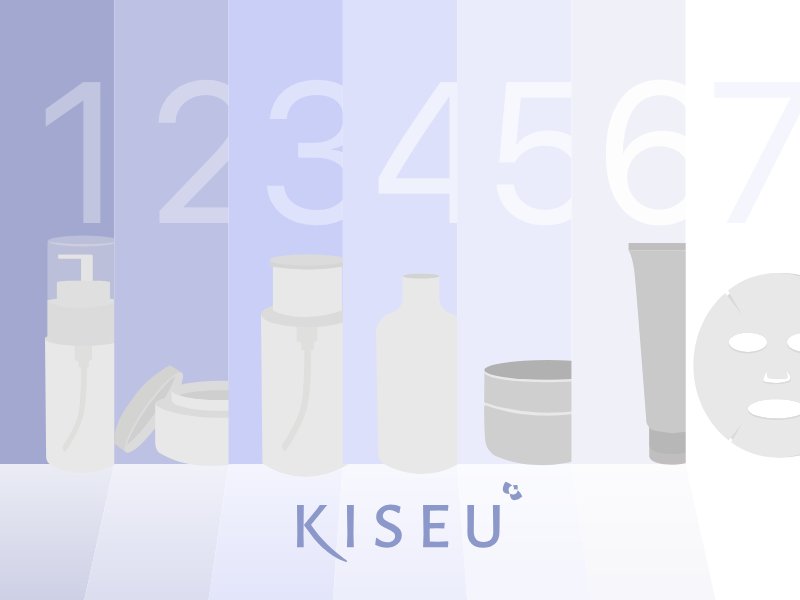 In comparison, the traditional 10-step Korean skin care routine looks something like this. With a lengthier routine you’re adding in steps that has treatments to target specific concerns. like fine lines, and Vitamin C serum to treat signs of aging or dark spots and hyper-pigmentation. Eye cream is another step you can add as you sort out your fundamental steps first, and later embrace the rest of the routine for full effect. An eye cream targets dark circles and wrinkles is also added to the mix. And lastly, a sheet mask is used to help nourish your skin with extra ingredients, while keeping it hydrated. So, in other words, it’s all about your specific goals and how much you can invest in your personalized beauty journey! With everything in mind, let’s get to the breakdown of this 7-step Korean skin care routine! If you’re using a physical exfoliator (scrub), the routine might take approximately 10 minutes, depending how long you scrub. 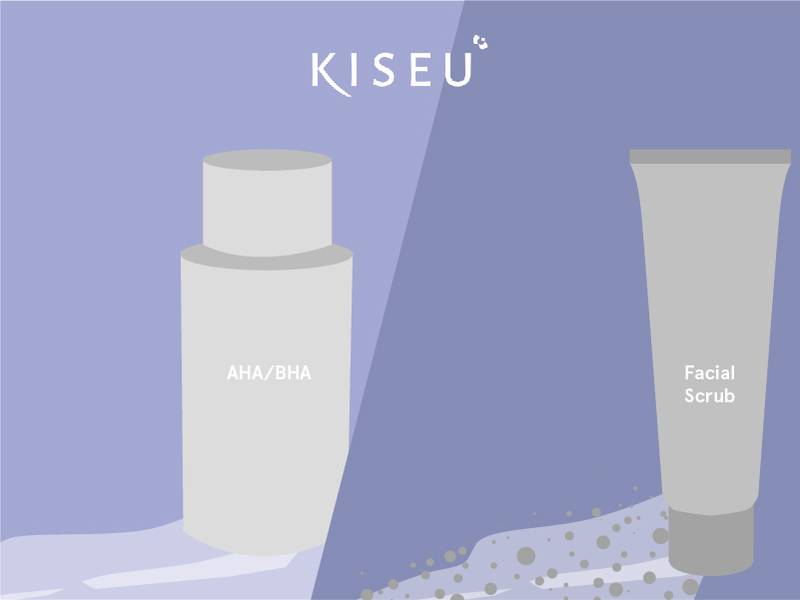 If you’re doing chemical exfoliation inputting the AHA and BHA exfoliating steps, you should be waiting 20 minutes for these acids on your skin before applying the rest of the products, so the routine might take 20 minutes. Before Tip: It’s all about customization when it comes to 7-step Korean skin care, along with trial and error. And just remember, with any new product, do a patch test, while introducing one product at a time so you can see how your skin reacts. Directions: Get started on the double cleanse to create a clean canvas for the following ingredients! An oil-based cleanser draws out oil-based debris like sebum, makeup, SPF and pollutants. Water-based cleansers can’t clear your face of oil-based residue because oil and water don’t mix. So that’s why after the oil cleanser, you use water-based/foaming cleanser to get rid of the dirt and sweat, lathering it in your hands and gently it into massaging your skin. Make sure to wash off with lukewarm water. Why? It all comes down to the double cleanse, where you start cleaning your face twice – first with an oil-based cleanser and secondly with a water-based cleanser. The oil cleansing step breaks up off sunscreen and makeup so that your foaming or water-based cleanser can wash it away. As a result, your skin will be cleansed from dirt, sweat, sebum, and left-over makeup. Tip: For skin care enthusiasts, clean your face multiple times to get the best possible results. The secret is in repeating this step 3 times, but if you’re working up to inserting a skin care routine into your life, leave the repeat steps for a little later. Also a good skin hack is to never use hot water either because it just dries out your skin. Directions: Simply soak a cotton pad and pat on clean skin, avoiding the eyes. Why? Revitalizing your skin and getting rid of dead or flakey skin regularly, will help you in your mission for brighter, healthier complexion. But 2 or 3 times a week is enough. The worst thing you can do is exfoliate excessively which will only irritate. 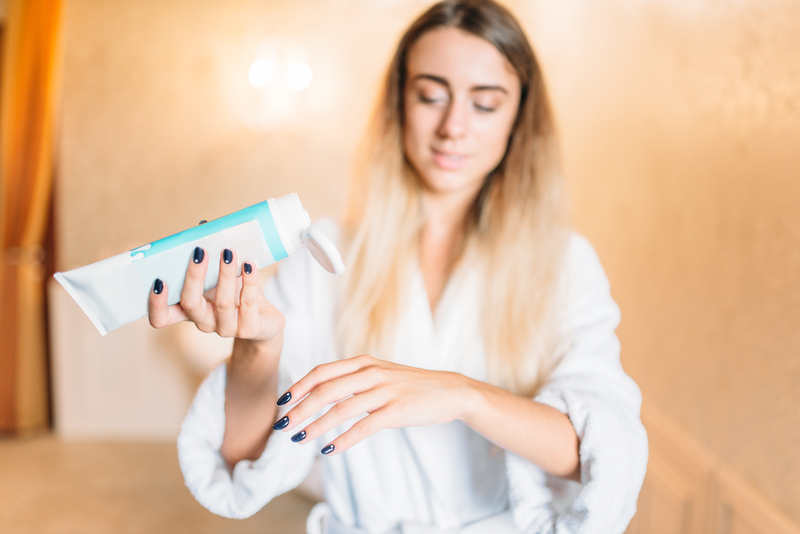 Choosing between a chemical and physical exfoliator: Physical exfoliators contain granules to massage into the skin and scrape away dry and dead skin, like a scrub. You’ll notice an improvement in your natural glow with this extra boost of circulation. The preferred option in Korean skin care is chemical exfoliation because it offers mild exfoliation and acids are amazing if introduced one at a time slowly (not all at once!). They’re classified as either AHA (Alpha hydroxy acid) and BHA (beta hydroxy acid). Tip: For chemical exfoliation, select either BHA (good for acne/oilier skin) or AHA (good for dry, mature skin) for a couple of days a week until you’re sure it’s helping, not hurting you. If using a physical exfoliator, you only need this a few times a month. Why? A toner is especially essential to balance your skin’s moisture and pH levels after cleansing, and to remove any impurities your cleansers didn’t remove. After using two cleansers and exfoliation, this will give your skin a boost of hydration to start the rebuilding process. Tip: It’s not good for your skin to become tight and dry before you apply moisturizer. For anti-aging cream success go right into toning without drying your face off. Directions: Apply an essence post-cleansing and before you apply serums, oils, and moisturizers by lightly patting onto your face. Why? Korean skin care is all about intense hydration! Plus if you are battling dry skin, we understand you need more than just a serum. Essence is not a toner or a serum, but a hydration product like a spray, with ingredients like hyaluronic acid and glycerin. Tips: In addition to providing moisture, an essence preps the skin for the rest of your routine. Why? Your eyes are one of the first places to show signs of ageing with wrinkles, dark circles and crow’s feet appearing over time. This is why beginning in your twenties, making an eye cream part of your daily skin care routine is essential. Directions: Generously tap onto areas of concern and let it absorb. Why? A serum’s goal is to to target an area of concern. Let’s say you start noticing fine lines near your mouth, it may be time to replenish with anti-aging cream. Tip: Invest in a quality serum by looking for ingredients that are proven to help aging skin like hyaluronic acid, vitamin C, and peptides. Directions: Each morning, gently apply moisturizer with SPF as the last step in your routine. Why? One last bit of advice we can all do well with here is to use SPF daily, and even better if we use a moisturizer with sun protection. Rain or shine, during your 7 step korean skin care routine, this is sure to protect your skin. If you’re going through all this trouble to make your skin look ageless, going out into the sun without protection will just destroy your efforts. Tip: Look for formulas with antioxidants and vitamin C. This step is a powerful way to help protect you from the damaging rays and keep the signs of aging at bay! Ready for the 7-Step Korean Skincare Routine? If you follow these steps on the regular, your 7-step Korean skincare routine will truly work for you. What’s not to love? We hope you see and feel the difference with dewy, younger-looking skin and a natural glow exuding from within! Follow our blog the latest and greatest in skin and beauty. Also visit our shop for any of the above solutions mentioned!